Within the framework of implementation of overarching national tasks, special attention is paid to the food production and the matter of keeping up with the consumer demand for quality food, which is of national significance. The poultry industry is able to make its fairly considerable contribution into solving the problems of the consumer demand for valuable healthy food products; and to create conditions for the national food security owing to this industry economic growth based on its production potential development and strengthening. The domestic and foreign practice clearly demonstrates that it is possible to provide the population with quality food within a relatively short term, primarily due to the increase of egg and poultry meat production. The poultry industry is not only the most dynamic and fast-growing branch of the livestock farming, but also it has the most intensive production methods. 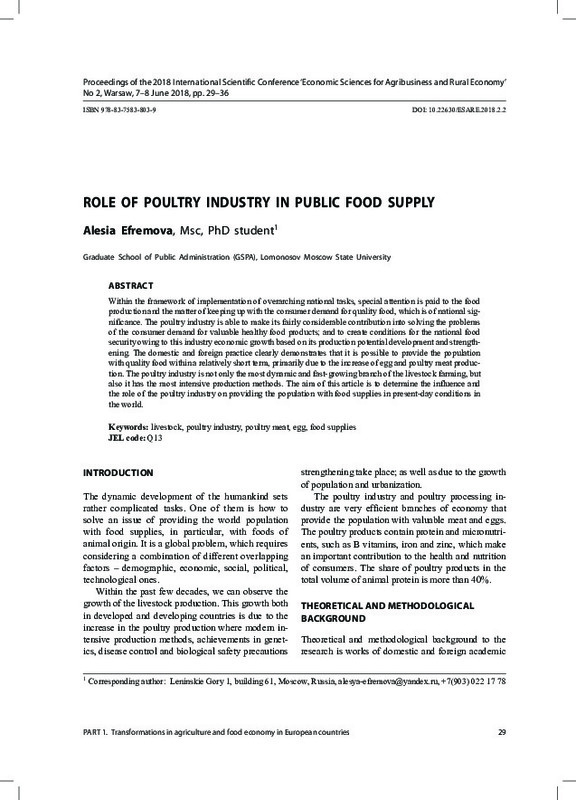 The aim of this article is to determine the influence and the role of the poultry industry on providing the population with food supplies in present-day conditions in the world.